Veganism is gaining much popularity in recent times as people are becoming more health- and environmentally-conscious. Especially in countries such as the UK and the US, where there are many vegan and cruelty-free products in the market. It’s not as easy to be a vegan in Singapore, without many prepared food options. Even if they are available, it comes with a hefty price tag. I do enjoy non-dairy milk, but only certain grocery stores carry them. Also, they are always more expensive in comparison to their dairy counterparts, so I’m less inclined to purchase them. 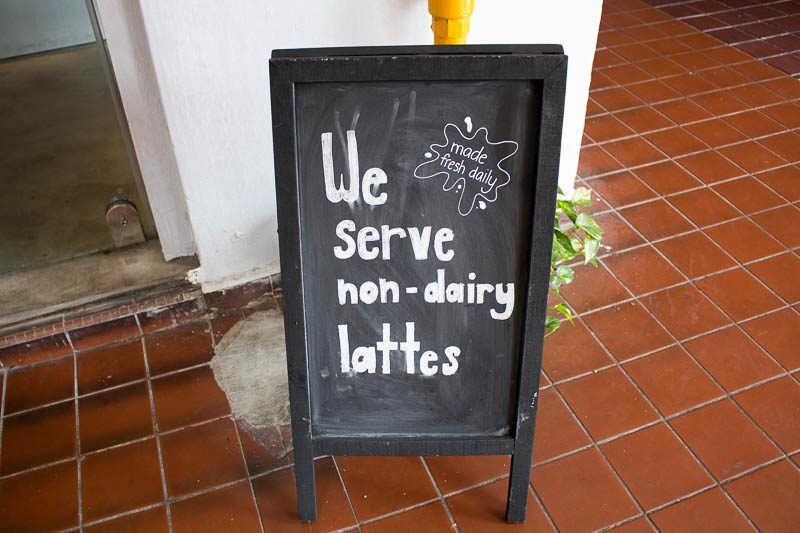 Even cafes and restaurants that offer non-dairy options often charge a higher price for them. 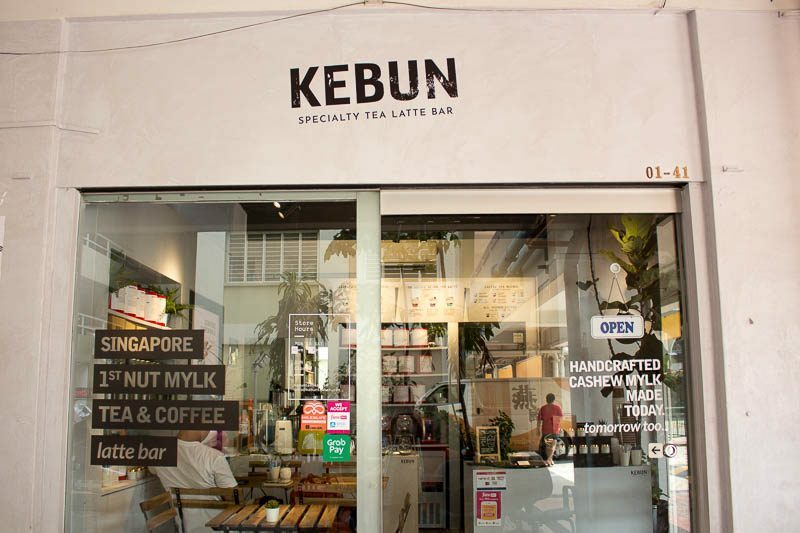 I came across Kebun in an inconspicuous area amidst traditional shops at Upper Cross Street. It stood out from the rest of the shops with its minimalistic design. Intrigued, I did a quick Google search on them. I quickly realised that they were a vegan bar, serving homemade cashew mylk (yes, it’s spelt this way on purpose). The vegan scene in Singapore isn’t the largest, so it was pretty courageous of them. The moment I opened the glass door and walked in, my nose was greeted with a distinct floral fragrance that was so calming. It made me feel like I was chilling in the park. One of the owners, Sham, was very friendly and sat down to have a little chat with me. Kebun means “garden” in Bahasa Indonesia, which I felt was very apt for this place, which had chill and relaxing vibes. I was curious about the rationale behind opening Kebun. He mentioned that both himself and his business partner, Eddy, are vegans. So one of their biggest difficulties was finding affordable alternatives for their diet. They wanted to provide clean and nutritious drinks for people to enjoy that did not cost a bomb. 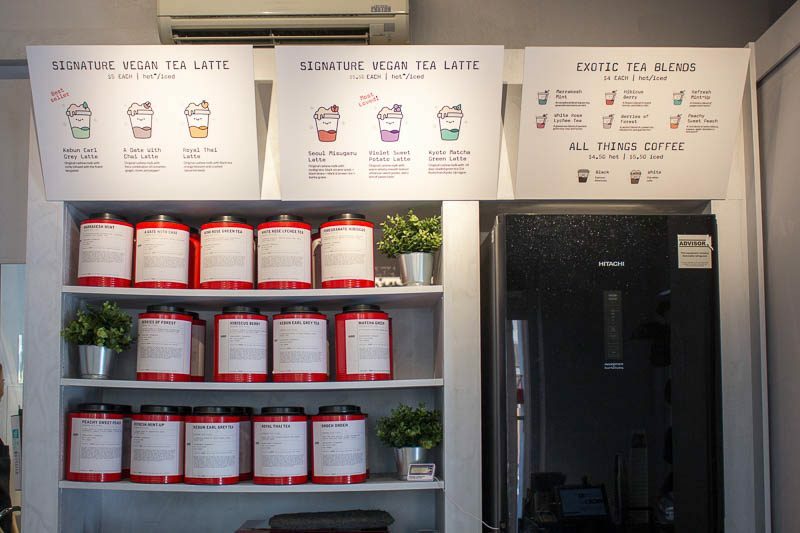 I took a quick glance at the menu and indeed, the tea lattes are only S$5, cheaper than your average coffee from cafes or Starbucks. The process of making cashew mylk is a tedious process. Sham shared that the India-imported cashews are soaked for 12 hours in the fridge. Afterwards, they are ground and passed through a tea sock. This process itself takes about four to five hours, and everything is done in-house daily. 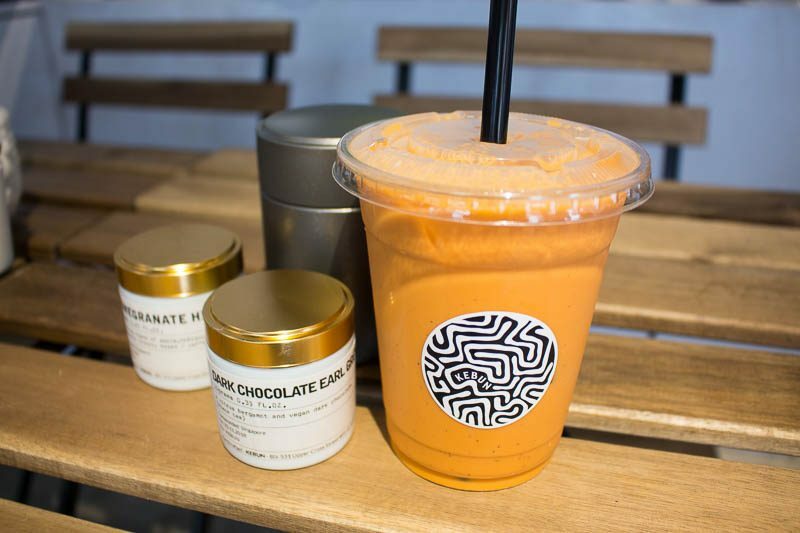 This is to ensure the mylk is carrageenan-free, which means all-natural and free from additives. Sham also let on that Eddy and he, have day jobs, yet they still tirelessly pursue this passion into their free time. He sometimes would visit the store before and after work to prepare mylk. The reason why they chose cashew mylk instead of other nut mylks was well thought out. I mentioned how I really like pistachio mylk, and he simply told me it was due to cost constraints. Pistachios are indeed a fair bit more expensive. He then told me about the wholesome nutritional value of cashew mylk, which has a very creamy texture, similar to cow’s milk. This is the most palatable for the masses, especially those who have never tried non-dairy milk before. 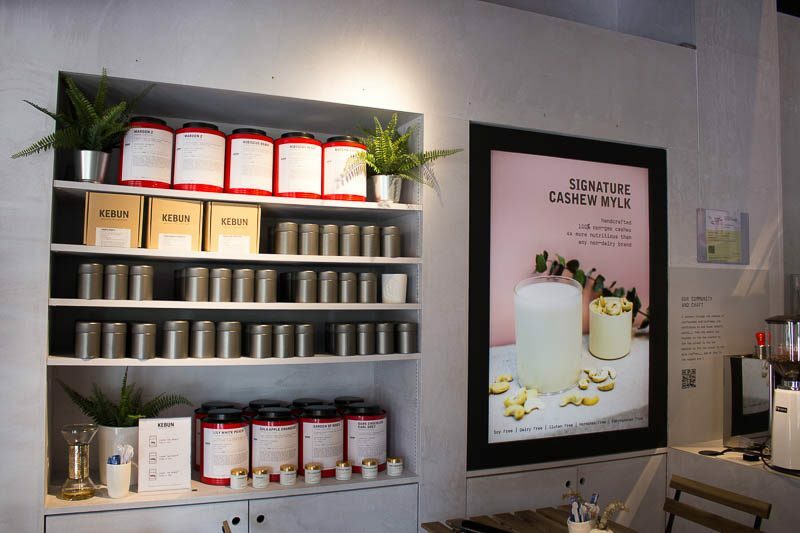 Besides homemade cashew mylk, they also curate their own tea blends. They have a tea master in Sri Lanka, who customises the blends. Once a month, they would even make time to travel to Sri Lanka to look at and select the tea leaves themselves. 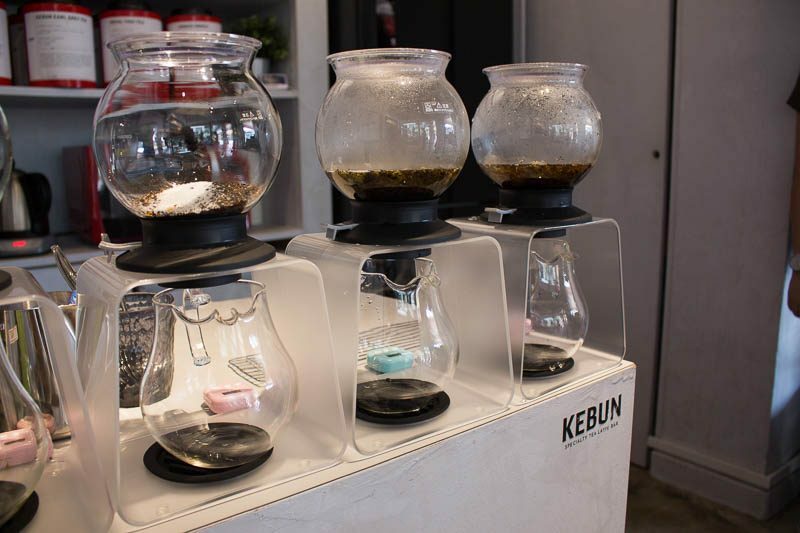 After finding out so much, I was even more eager to try out the drinks at Kebun. I greedily got three drinks (oops) so that I could try a variety. While I was waiting excitedly for my drinks, I got to see the intricate way they were prepared. 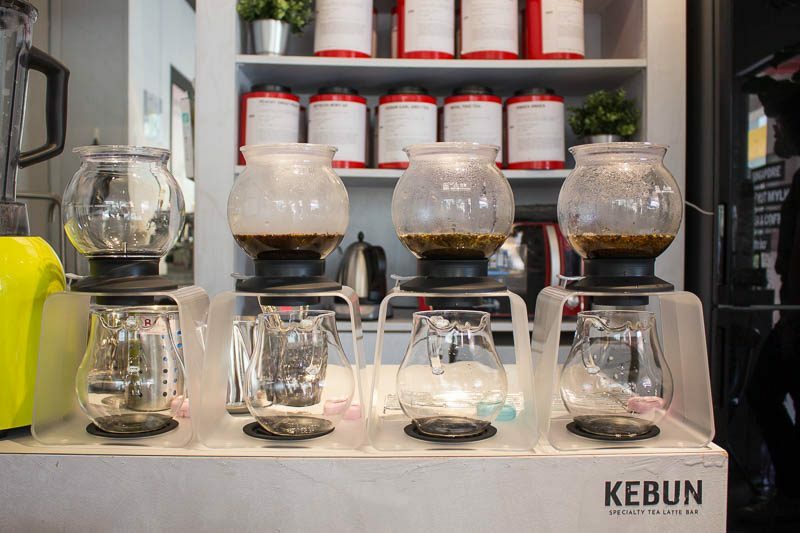 Each drink uses 11 grams of tea leaves, weighed out precisely. They are placed into a Japanese Hario tea dripper to steep. Different tea leaves require varying steep times, and they are all watched over accurately with a timer. Talk about attention to detail! 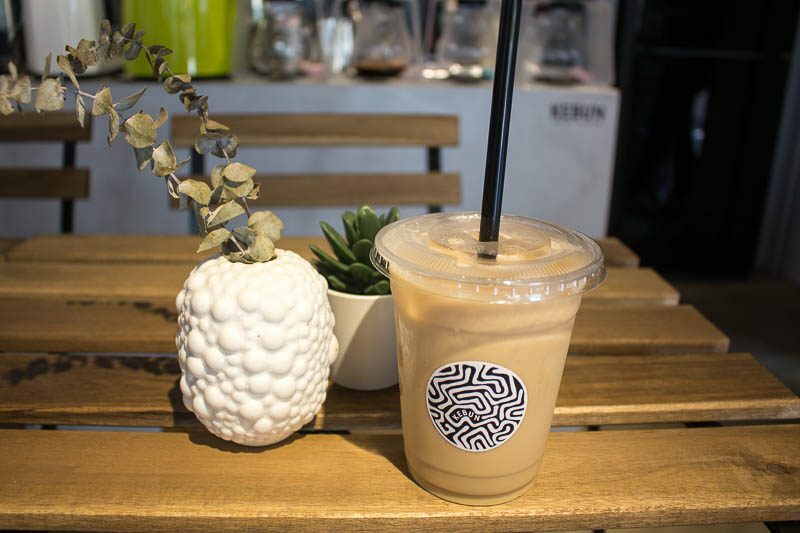 The first drink I decided to try was their best seller, Kebun Earl Grey Latte (S$5). The tea itself was very fragrant, and the moment I had a sip I was sold. The homemade cashew milk was creamy, and it blended seamlessly with the tea. The flavours were very balanced and felt velvety smooth with the bold yet refreshing Earl grey. 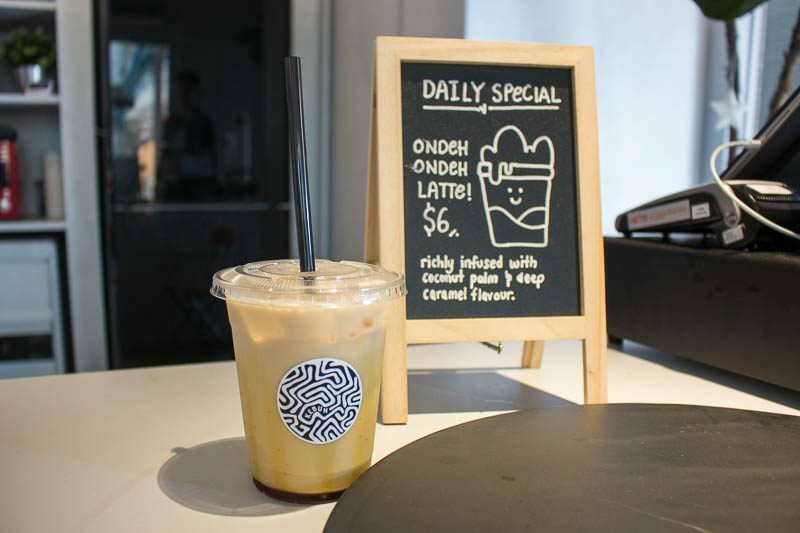 The second drink I got was the Royal Thai Latte (S$5). 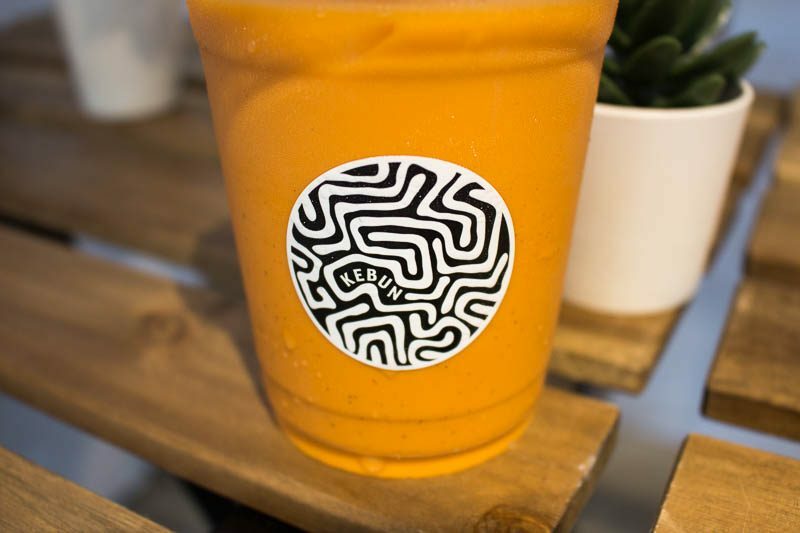 I wondered how this would fare, compared to the usual Thai milk tea that uses both evaporated milk and sweetened condensed milk. The bright orange colour was unmistakable, due to the orange blossom in the tea blend. However, I must admit, tastewise there was something slightly amiss. Perhaps I’m just more used to an intensely sweet and buttery version, though this is definitely a healthier option. The last one I got was my favourite one of the lot; their seasonal Ondeh Ondeh Latte (S$6). I loved this so much I almost got the loose leaves when Sham mentioned this flavour was going to be replaced sometime in the near future. This Ondeh Ondeh Latte looked strikingly similar to the Earl Grey Latte, with a pool of gula melaka that sunk to the bottom after it was drizzled around the cup. I mixed it around and dove straight into the drink. What struck me as confusing at first immediately turned into sheer satisfaction. It tasted literally like an ondeh-ondeh in liquid form. The tea blend had a distinct pandan aroma, with light milky and toasted notes from the dried coconut pieces. The gula melaka gave a caramelised sweetness and the subtle nuttiness of the cashew mylk enhanced the signature ondeh-ondeh taste. It was absolutely delightful! The sticker on the cups was very abstract and I had to ask if there was any meaning behind it. It looked like the tea fields, where they get their customised tea blends from. For those who do not fancy milk (of any kind) in their drinks, you will be pleased to know they have a wide range of hand-picked tea blends as well, such as Dark Chocolate Earl Grey and Gala Apple Cranberry. 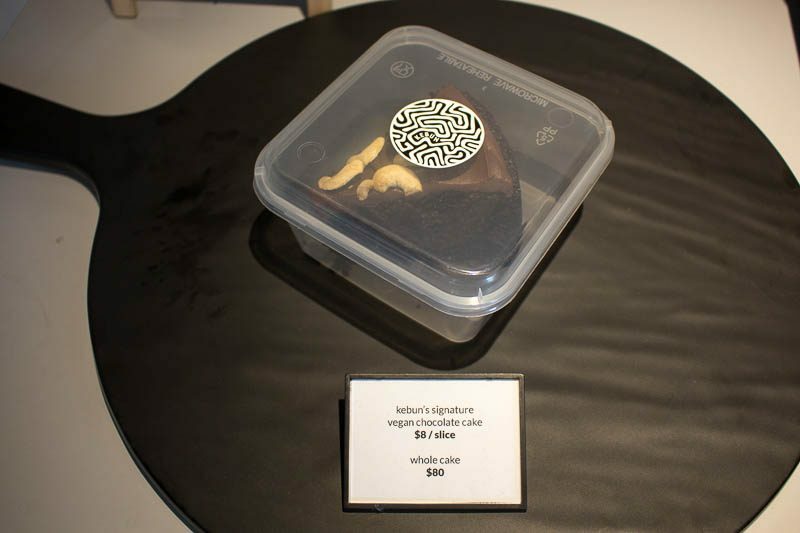 They also just started rolling out vegan desserts, such as Vegan Chocolate Cake and Vegan Kueh Lapis Sagu. Unfortunately, the latter was sold out by the time I visited so I didn’t manage to try it. These were outsourced to a trusted home baker, as they wanted to put a vegan spin on common well-loved desserts. They are also working with Chalk Farm, a popular cake company known for their bakes and Nyonya kuehs. I really appreciate the thought behind the establishment of Kebun. It obviously highlights the passion of both Sham and Eddy, who aim to share and promote their lifestyle. They are very attentive, even when sourcing for coffee beans as they ensure the beans are not roasted with butter. Pricewise, I definitely think it is worth it for the size of the cup, which is easily similar to Starbuck’s Grande for easy reference. Since it’s just a five-minute walk from Chinatown MRT, I foresee myself patronising Kebun more often to try out the other drinks they offer.